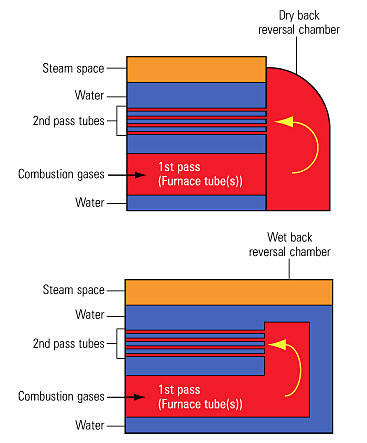 Firetube boilers are often characterized by their number of passes, referring to the number of times the combustion (or flue) gases flow the length of the pressure vessel as they transfer heat to the water. 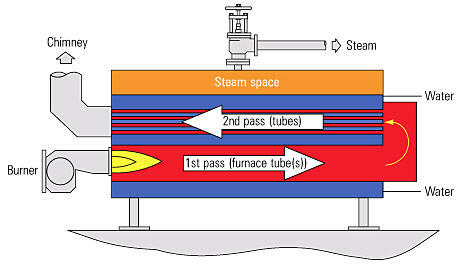 Each pass sends the flue gases through the tubes in the opposite direction. To make another pass, the gases turn 180 degrees and pass back through the shell. The turnaround zones can be either dryback or water-back. In dryback designs, the turnaround area is refractory lined. In water-back designs, this turnaround zone is water-cooled, eliminating the need for the refractory lining. 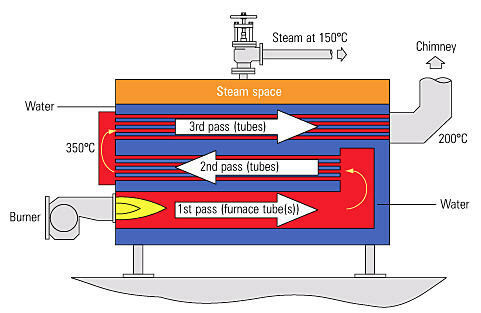 The number of passes the boiler contains affects the boiler efficiency, and its first cost to manufacturer. The more heat transfer surfaces the boiler has, the more efficient it can be. However, this also increases the amount of material it contains and therefore the first cost. Identify the number of passes that the boiler has be which end the flue is on, and the approximate size of the vessel.